From end-to-end and in just five years, the Compound Semiconductor Applications Catapult intends to have transformed the UK supply chain. Chief Executive, Stephen Doran, tells Compound Semiconductor, how. In August this year, the South Wales-based Compound Semiconductor Applications Catapult launched with an ambitious remit to accelerate UK economic growth in compound semiconductor-related industries. Having received a hefty Â£51 million in government funds, the centre already employs some 23 staff and intends to soon create around 100 jobs internally including engineering positions. As the Catapult chief executive, Stephen Doran, puts it: "We are open for business, hiring and ramping up business and want to make a real difference to the UK supply chain... come work and collaborate with us and we can grow UK industry." Ask Doran about future Catapult plans and he is quick to first point out the scale of the opportunity for UK-based compound semiconductor companies. Analysts have estimated the global market for compound semiconductors is set to grow from a 2016 figure of $66 billion to more than $300 billion come 2030; three times the growth rate of silicon. What's more, recent analysis from Doran and colleagues indicates that in 2017, the global market had already increased to $74 billion. Given these rapidly rising numbers, the impact of even a few percent increase in market share could be profound for any nation. "The UK currently has around 9% of this market share right now and we need to maintain this share," says Doran. "But if we can help the UK to increase this share by even just one, two or three percent, this would make a significant difference from an economic perspective." According to Doran, collaboration amongst existing UK companies is going to be critical to growing to market share. Catapult figures indicate that the UK already has more than 100 companies actively working with compound semiconductor devices. Meanwhile some 5000 UK businesses - of which 90% are SMEs - are designing and making electronic components, devices and systems. For its part, the Catapult has already been in contact with hundreds of businesses - including Anvil Semiconductors, Microsemi and IXYS UK Westcode - to develop its strategy. And the centre intends to work with more than 1000 business and help to create 1000 jobs come 2023. But right now, a coherent supply chain does not exist. As the chief executive points out: "We have talked with SMEs and sometimes these companies ask us, 'how can you help us to gain access to the tier one players'. Yet at the same time, tier one players say, 'where is the supply chain across the UK." To help to address this disconnect, the CSA Catapult is in the process of setting up an Innovation Centre, scheduled to open at the end of March 2019. "This centre is designed to be open and collaborative so companies can overcome this barrier and get together," points out Doran. Stephen Doran is Chief Executive Officer for the Compound Semiconductor Applications Catapult. Crucially, the centre will also house a design studio, as well as laboratories and test facilities supported by simulation and modelling tools to get compound semiconductor development out of the lab and into industry. "From our discussions, SMEs see access to expensive capital as well as the expertise to operate the capital as a key industrial barrier; the Innovation Centre will help here," says Doran. "Today industry is well advised in, for example, silicon modelling tools but life becomes difficult in mixed signal [devices] and even more difficult when you bring in compound semiconductors; so we are looking to make investments to improve models so more designs can come through." The Catapult is also intent on designing and manufacturing Evaluation Modules - using UK-sourced semiconductors where possible - to help companies prototype systems more quickly and cheaply. The first modules will be for power electronics, radio frequency and microwave, and photonic applications. And as Doran highlights: "There's a cost, cycle time and labour element to developing these, and it will easily cost half a million pounds to develop an evaluation module." "But we are in the process of deciding the first modules with industry now as we want to get [devices] to the market fast," he adds. "We expect to deliver six in the next two years." In addition to the Innovation Centre and Evaluation Modules, Challenge Programmes also form a critical, third arm of the Catapult's strategy. Due to be announced within weeks, these programmes will be set up to identify how compound semiconductors can address global challenges and help SMEs to supply products to large companies with access to global markets. As part of this, the Catapult will be assessing if industry needs a particular compound semiconductor supply chain, and has already identified the need for a scaleable supply chain in the production of silicon carbide. "This doesn't exist today as an open foundry," says Doran. "If companies want to buy silicon carbide they go elsewhere or create that capability themselves." "But if we create a silicon carbide supply chain in the UK, and from there develop evaluation modules that go straight into industry, this would be a huge help... we would have a supply chain right on the doorstep for UK industry," he adds. So as the Catapult makes its final decisions on Evaluation Modules and Challenge Programmes, bringing companies together to establish a solid UK compound semiconductor supply chain will no doubt remain a key theme. Doran is keen to highlight the successes of wafer producer, IQE, but also points out the potential to grow the supply chain from here. "IQE are at the early part of the supply chain, yet more value lies at the consumer end of the chain," he says. "So as we work our way along that supply chain, the more value we can embed in the UK, the better the overall economic impact for us." 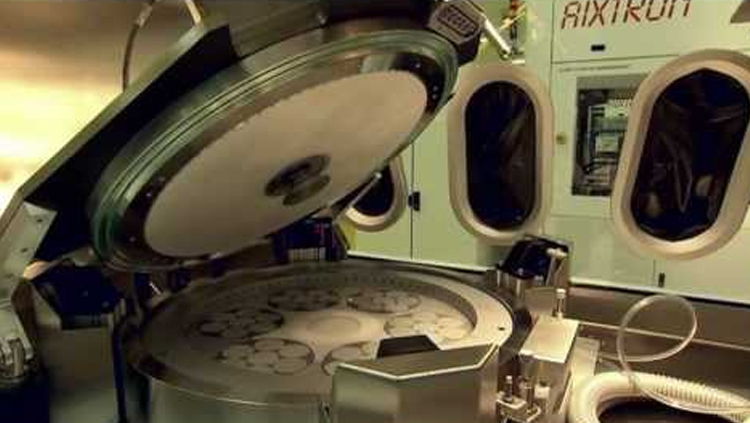 Indeed, only weeks ago, the Catapult announced a collaboration with the University of Bristol, to find out the best way to get the university's cutting-edge thermal wafer mapping tool, Thermap, to the businesses that need to characterise wafers. "The UK has so much core capability but we are not so good at collaborating," he says. "We want to make sure companies in the UK understand the potential of what is in the UK... this ability to link one company with another is going to be extremely powerful."